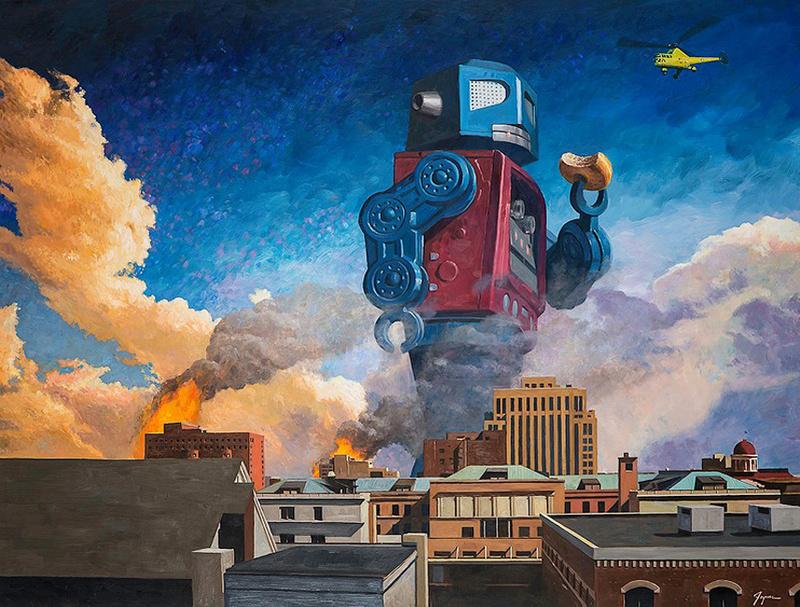 Eric Joyner started out his career within the commercial sector of the arts industry as an illustrator, then towards the end of the last millennium, made a conscious shift into the world of fine art. At this point, he made a solemn promise to himself only to focus his time and attention on subject matter he loves. 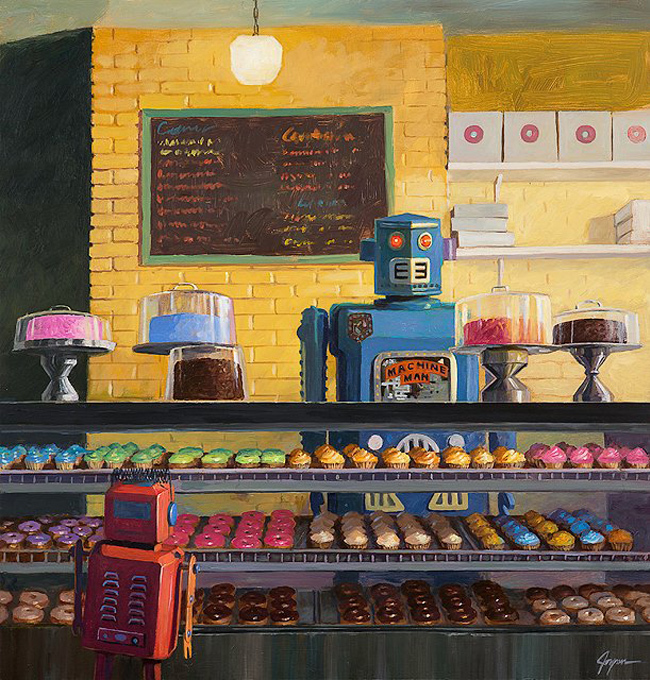 Eric has since filled his imagery with epic tales featuring an ongoing synergy between robots and doughnuts. 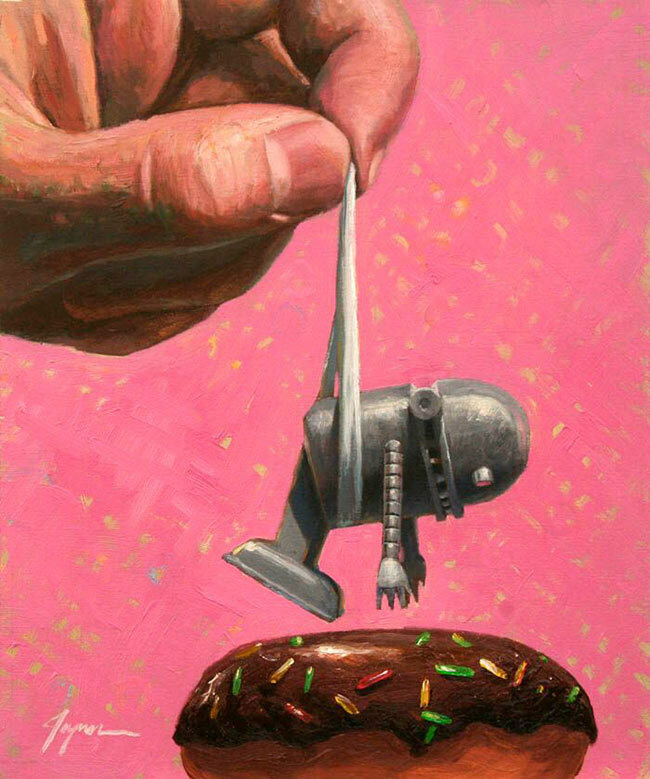 Utilizing his natural painterly technique, Joyner injects a lively dynamism into the inanimate toys and confectionery that serve as his muses. 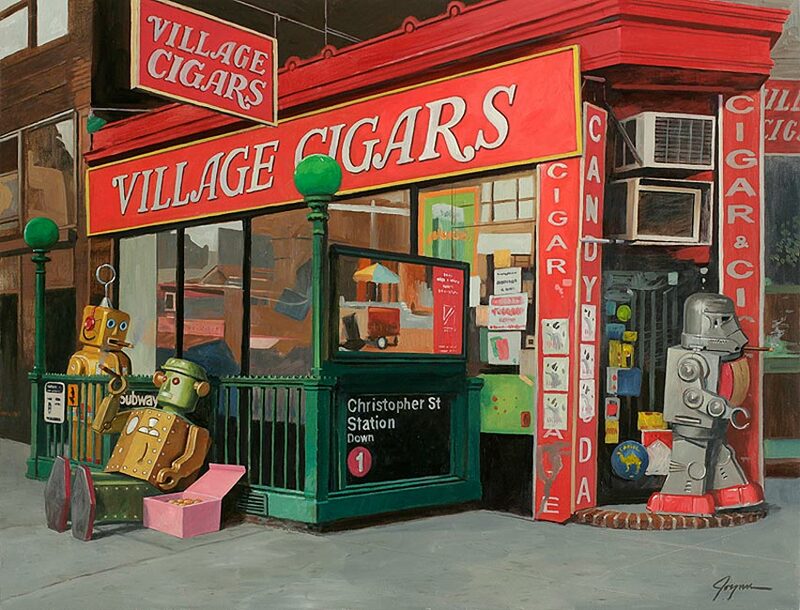 Through astute observation of the human species and our whole gamut of emotions and behaviours, Eric captures the essence of what it means to be human and reflects it back at us through his engaging menagerie of colourful characters. 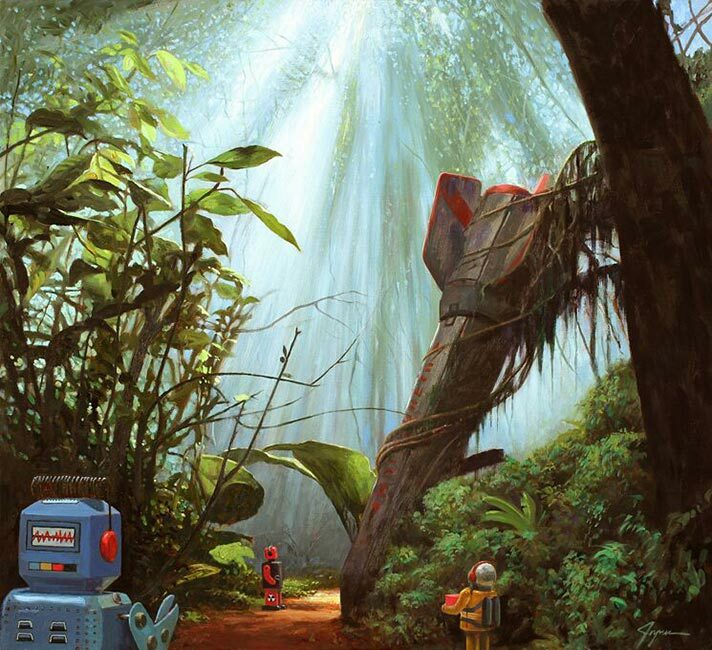 Eric Joyner was born in 1960 and grew up in San Mateo, California and he still lives and works in San Francisco to this day. 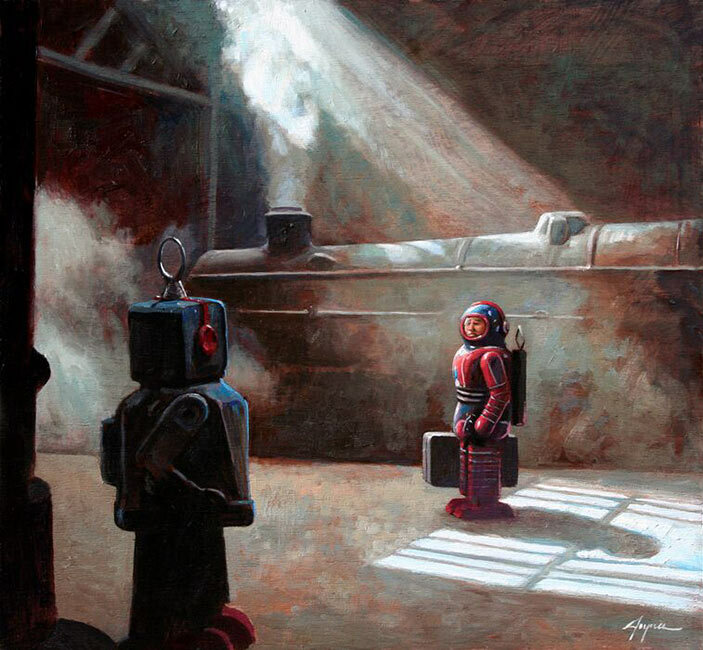 Joyner studied Illustration at the Academy of Art University in SF. 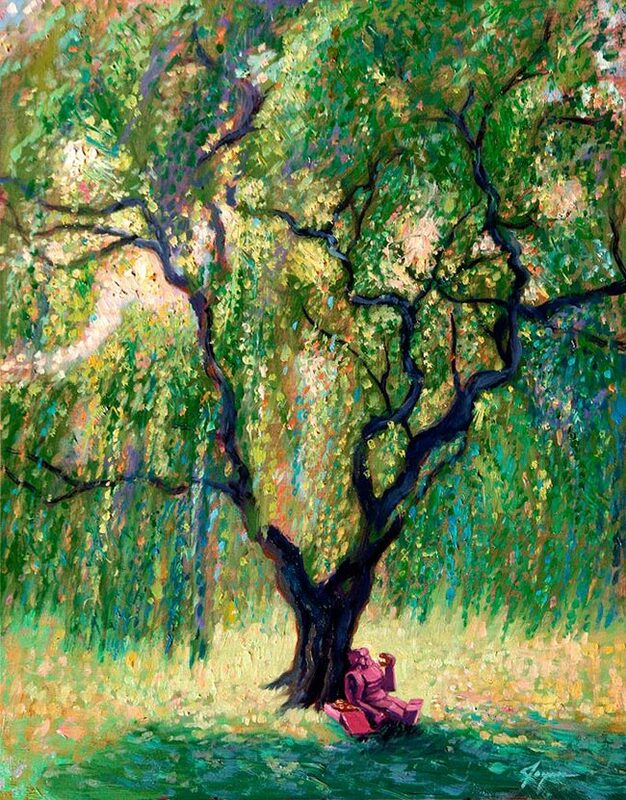 His art has been exhibited extensively and he has won numerous awards, including the Spectrum Contemporary Fantastic Art No. 11. Eric’s work can also be found in the collections of many high profile companies, such as Microsoft and Warner Bros.
WOW x WOW caught up with Eric recently to find a out a little bit more about what makes him tick. Read on and find out what he had to say in the following exclusive interview. Hi Eric! Firstly, thanks very much for making time in your busy schedule to have this chat, it’s most appreciated. To start us off, if you could please introduce yourself, touching on any background info you feel helpful to enlightening us as to how you have come to this point in your career? No Problem! I grew up in a lower middle class, blue collar family, in San Mateo, California. I was the last of 5 kids and my parents let me run wild for the most part. Though running wild was fun, I did like to sit quietly and draw as well. And so it started in kindergarten. At a certain point, for reasons unknown, I decided I wanted to reach my fullest potential as an artist and after a year in high school, decided to go to art college. I didn’t know about illustration, but that’s what I studied in college and did work as a freelance illustrator for 16 years before the somewhat gradual shift to gallery artist, around 1999. 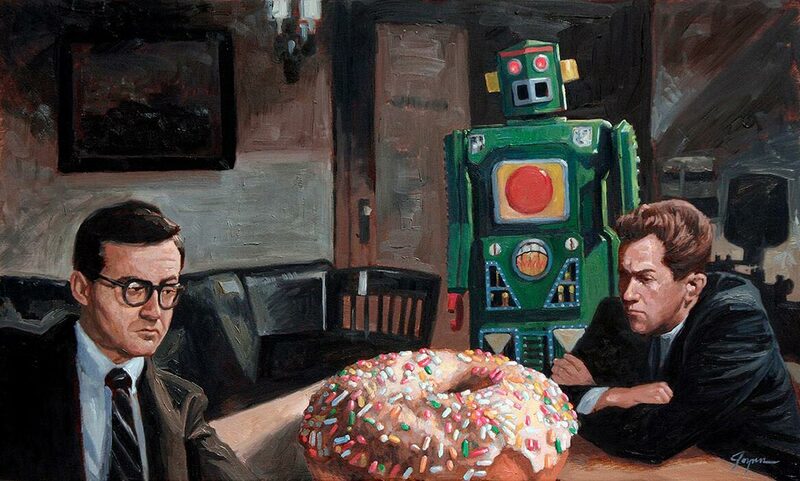 The Surrealist’s stock-in-trade was often the pairing of unrelated items. Do you feel that you have anything in common with them? What is it that you find most interesting about taking two unrelated objects (i.e. 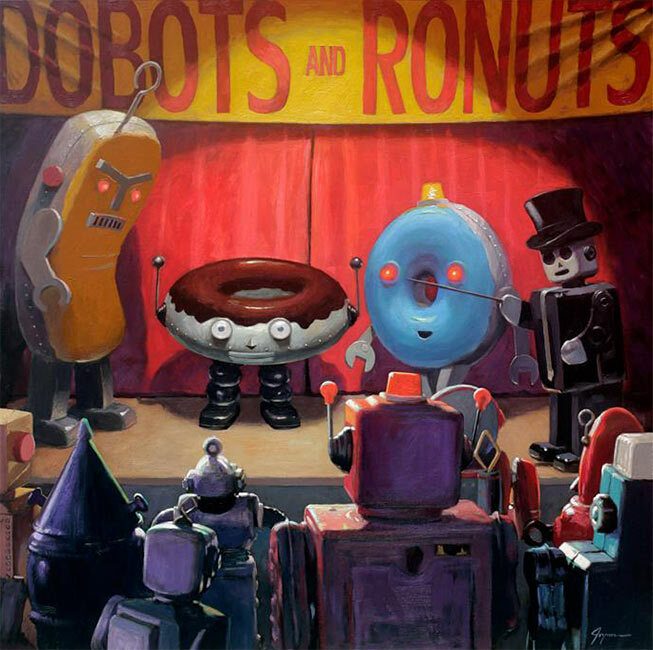 robots and donuts) and pairing them together in unexpected ways? 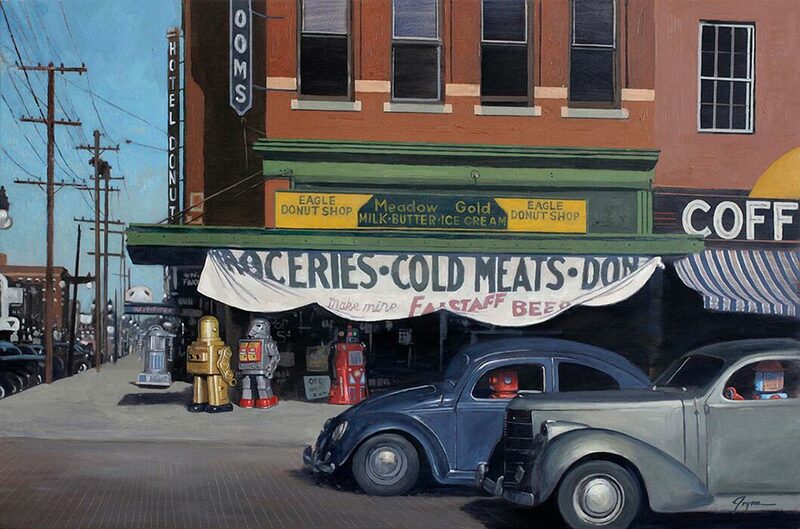 I do paint realistic, like a surrealist, but I think they had good, thoughtful reasons for doing it, didn’t they? My work is more absurd, at least I hope so. There are many shades of grey. What do I find most interesting? 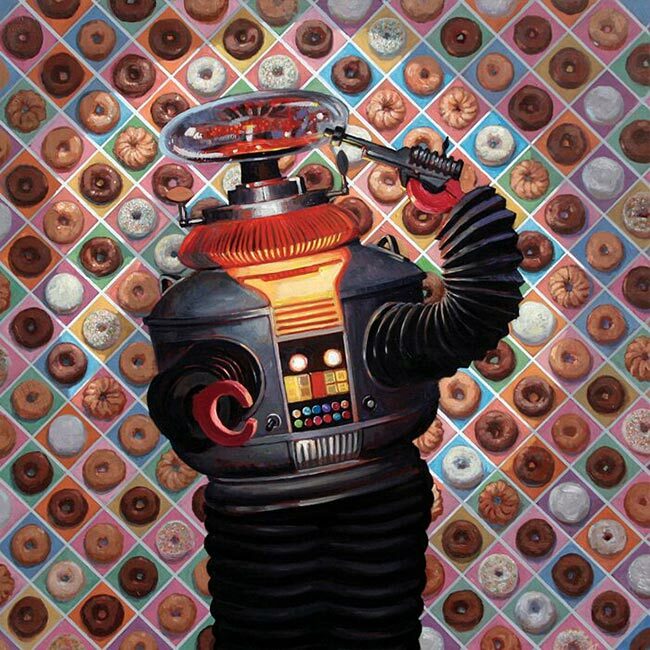 – that I can communicate a variety of ideas and evoke an emotional response, using robots and donuts. Your paintings, although fantastical are painted with terrific realism. However, your hand is clearly evident in the creation of your works through the sumptuous brushstrokes on display. 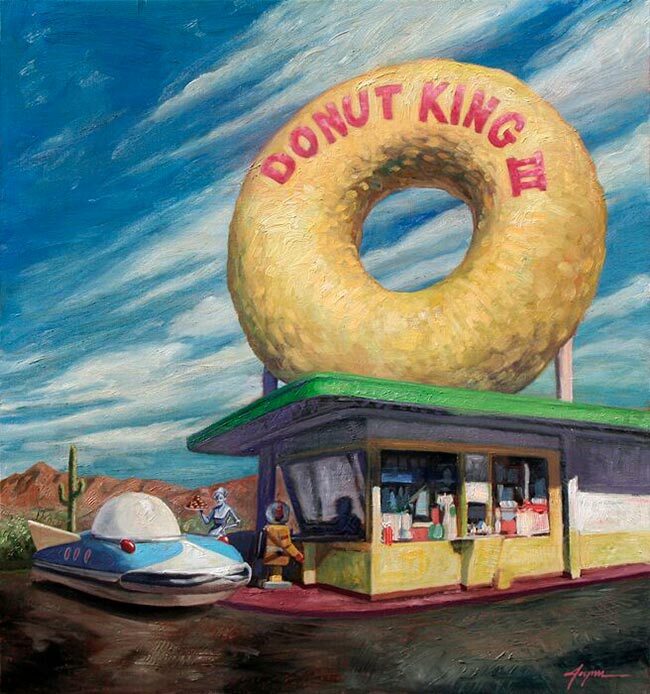 Do you feel that seeing the artist’s hand is important or is your painting style something that has evolved naturally? Thanks! 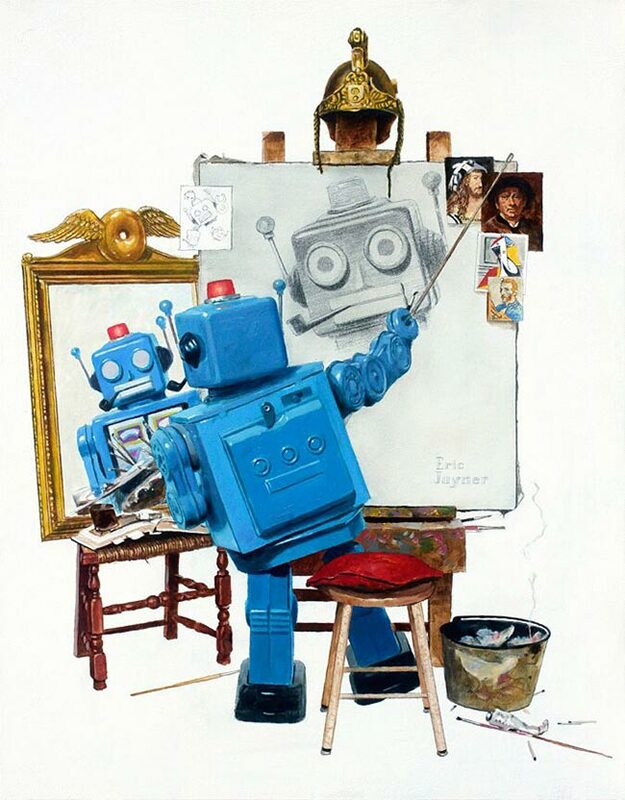 I do what feels natural… I do admire the vintage painterly illustrations by Wyeth, Cornwell and Leyendecker – they probably influenced my ‘style’. 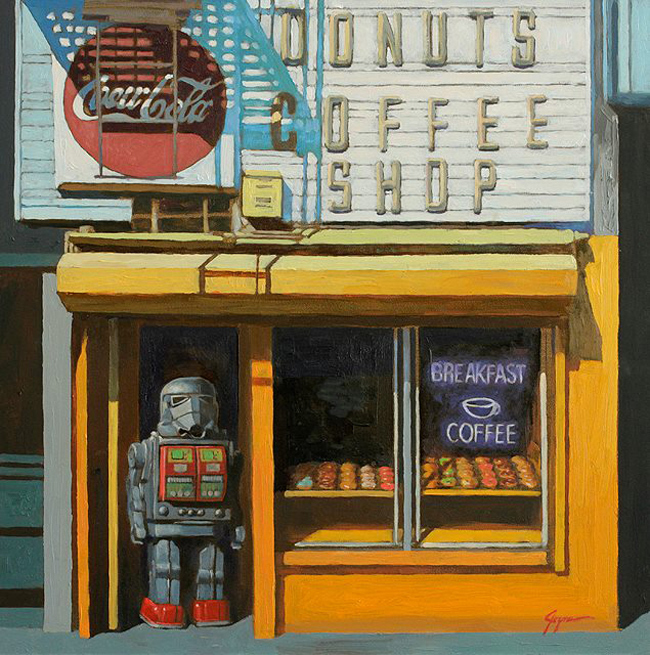 Talk to us about how you approach the nostalgic aspects of your subject matter? Do you find that your work appeals more to an audience of a certain age group? 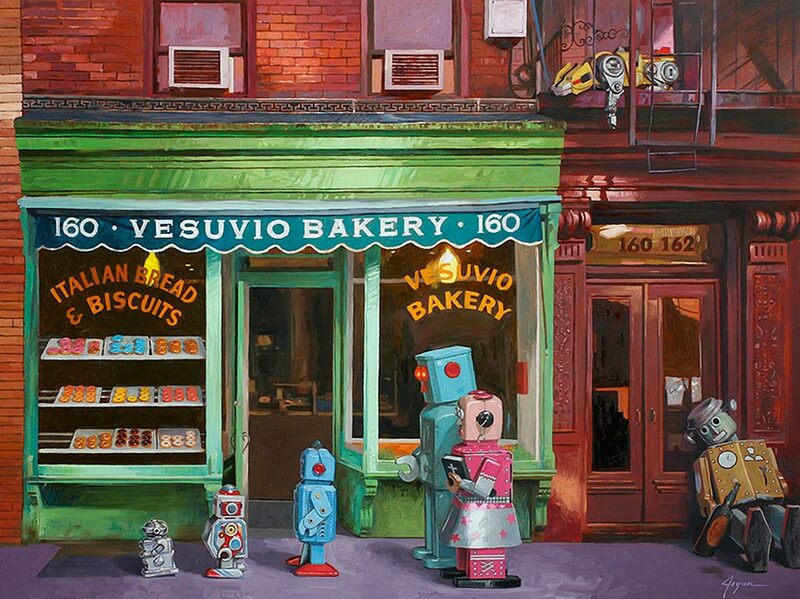 The nostalgic aspects of the robots I paint are self evident, by their shapes and colors. It is interesting and funny to see how we used to think the future would look. 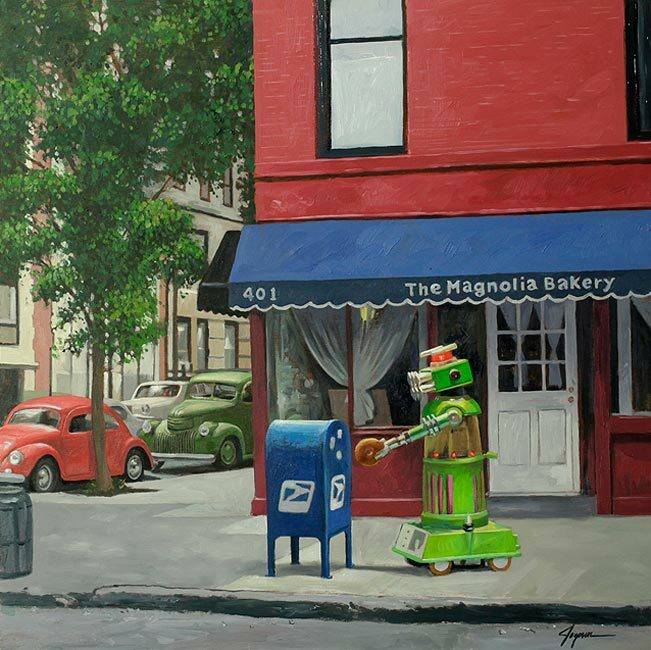 The robots I paint at this time were made between roughly 1938 to 1982. I’m sure certain ones are more appealing than others, to certain age groups. Which ever ones they had as kids, of course. Having previously worked as an illustrator and animator, what have you found to be the most challenging area of working life since you’ve made the switch to being a fine artist? That would be everything to a certain extent… the top 3 would be 1) deciding what to paint 2) paying bills 3) dealing with people who don’t like you. Can you talk a little about being a collector and the collections that you have accumulated? I enjoy collecting art and would like to do more! So far, I have collected Shawn Barber, Lou Lima, Francis Livingston, El Coro, Terry Hoff, Kim Cogan, Sho Murase, Kazuhiko Sano, Jennifer Hansen, Derek Lynch, Jane Kim, Mike Maxwell, Jessica Hess, Bill Sanchez and Kevin Keul. What do you know now, that you wish you would have known when first embarking on your artistic career? Yes, I would not have admired (envied & obsessed) over the skill and popularity of living illustrators – big mistake! I also would have trusted the validity of my own thoughts. 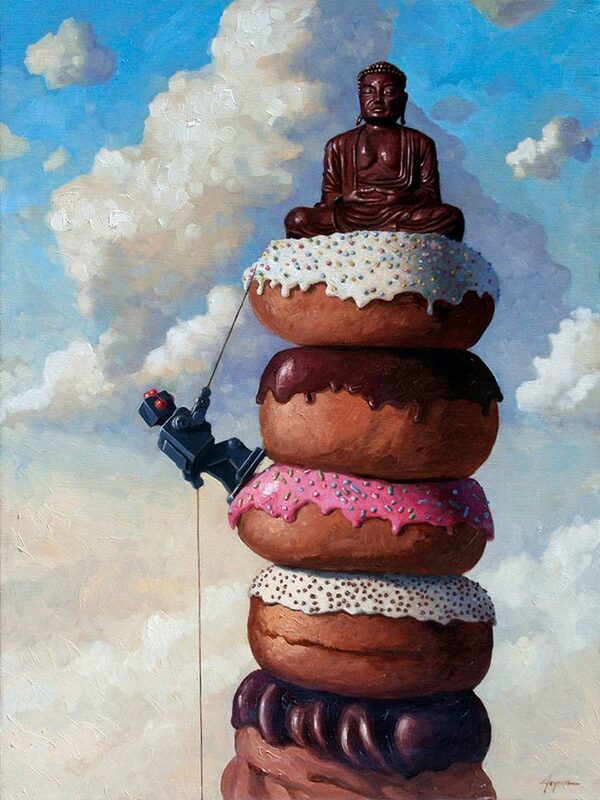 I would have gone into fine art much earlier. Do you ever let viewer feedback have any influence on your work? Yes – no man is an island. I do have my limits though. Sometimes I get indignant and think what a dumb idea someone had suggested, only to realize after I do the painting, that it was a great idea! This would have to be a book, wouldn’t it? In a nutshell, I never became what I wanted to be (a sought, after book cover artist). I tried animation, illustration, storyboarding and texture mapping as well as 5 different painting directions, before hitting rock bottom in every possible way. This work, and these detours, formed the basis of what I do today. What is your relationship with art history? 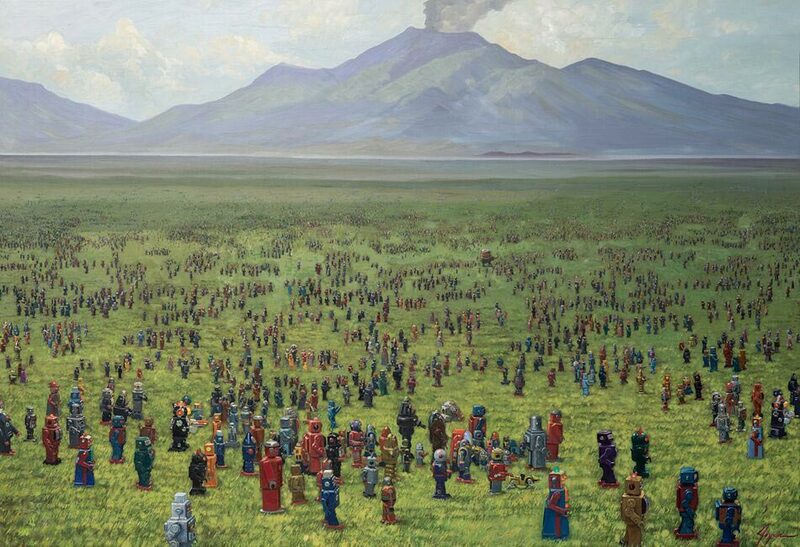 Do you feel it is important for artists to have a knowledge and understanding of what has gone before them? Art history is enriching as well as interesting, and inspiring. I think all successful artists have some knowledge of what has gone on before them. In order to not repeat the past and be original (key to success) you have to know history. 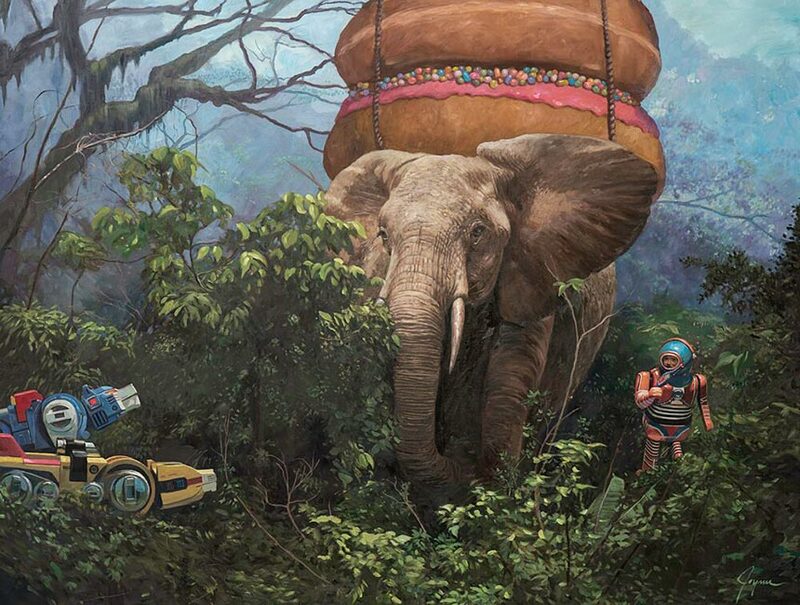 What’s next for Eric Joyner? 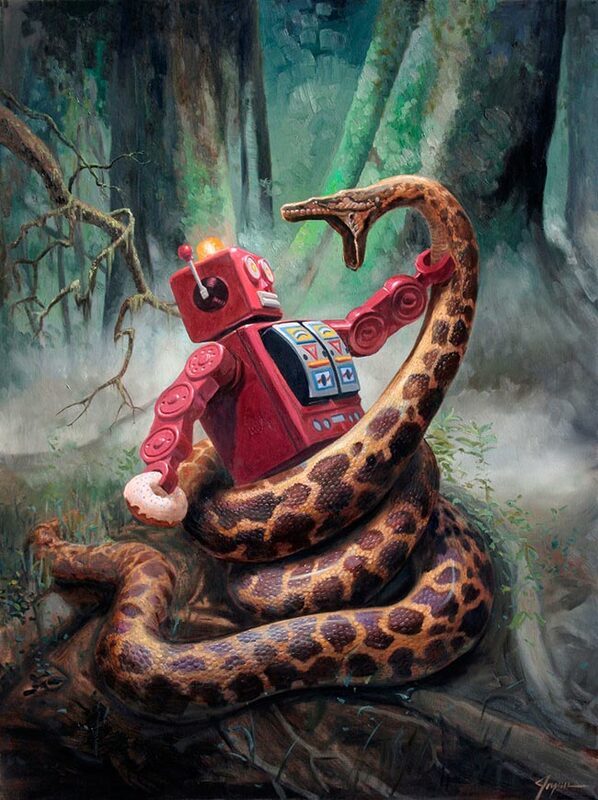 I’m painting for a solo show, this January at the Corey Helford Gallery in Los Angeles. I have a designer toy available at DesignerCon in Pasedena this November. Also some commissions and possibly a museum show in Madrid, Spain.